Preheat oven to 450° F. Rub the chili powder and grill seasoning over both sides of the steak. In a medium skillet, heat the oil over medium-high heat and sear the steak for 7 – 8 minutes per side. Remove the meat to a cutting board to rest. While the meat rests, add the butter to the same skillet, sauté the mushrooms until golden brown, and remove from heat. Spread the barbecue sauce onto the crust, leaving a 1" border around the edge. Slice the flank steak against the grain into 1/2" thick slices. Meat will be slightly pink in the center and will continue cooking in the oven. 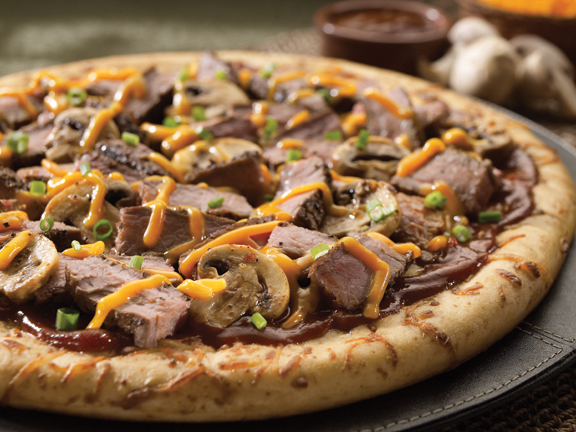 Layer the steak, cheese and mushrooms over the barbecue sauce, and bake for 10 – 12 minutes until cheese is bubbly and crust is golden brown. Garnish with fresh chives.